Adventures in Stitching: I'm not dead yet! I usually do try to update more often than this. It is amazing how quickly that delicate balance of kids-work-hobby can be upset by a simple thing as a minor cold. 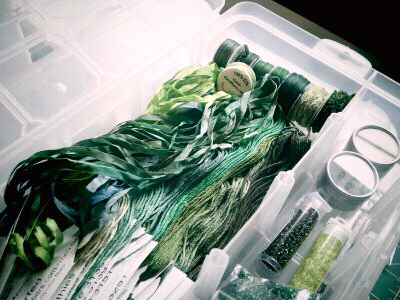 But yes, there are more mossy rocks in the works, and as proof, a photo of all the lovely greens in my project box.